Be the envy of your colleagues with this healthy... - Cooking @ planetfem - recipes, advice, good food and more! 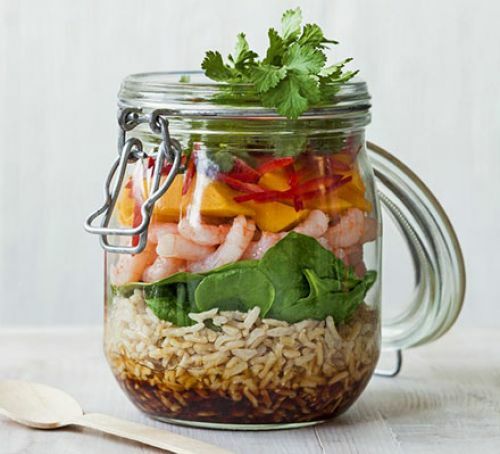 Be the envy of your colleagues with this healthy layered salad: “Prawn, rice & mango salad”. Its so obvious why this salad is healthy and delicious as well. Consider having it at least once during the week, it will supply you with enough nutrients and energy to cope with the hard work you’re probably facing. We can find anti-Inflammatory and anti-Cancer benefits from spinach Phytonutrients; antioxidant; and Help You Bone Up because of the wealth of vitamin K provided by spinach. Mango added to this jar salad is a wonder in itself. Mangoes may very well be the king of all fruits. They fight cancer, alkalize the body, aid in weight loss, regulate diabetes, help digestion, clean your skin, and make the perfect snack. There are many healthy reasons why you should be eating a mango every day. It fights cancer, keeps cholesterol in check, skin cleanser, alkalizes the body, regulates diabetes, helps in digestion etc. Make the dressing by whisking together all the ingredients. Tip the dressing into the bottom of a big jar, top with the rice and put in the fridge if making the night before. Layer the spinach, prawns, mango, chilli and coriander on top of the rice. Leave a little space at the top so that when lunchtime arrives, you can shake up the salad to eat.